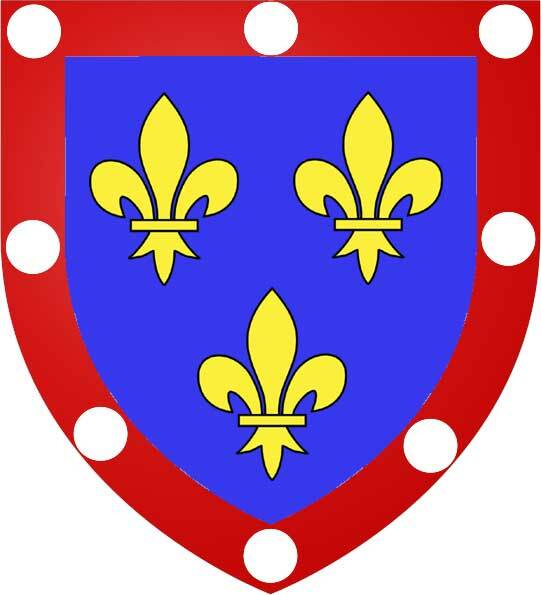 Jean the Duke of Alencon was born in 1407 into an illustrious family of soldiers. His great-grandfather had been killed at the Battle of Crecy, his grandfather spent his life fighting the English as a comrade of the legendary warrior du Guesclin and his father had died a hero at the battle of Agincourt. Alencon began his own military career when he was just a teenager and was captured at the Battle of Verneuil in 1424 and was held prisoner until 1429 when he was finally released after his payment of a huge ransom that left him with financial problems. Alencon was close to Chinon when Joan Of Arc first visited Charles VII in the spring of 1429. When he heard that a young woman had arrived at the court of Charles declaring that she was sent by God to raise the siege of Orleans he immediately went to Chinon so see for himself. When he approached Joan she asked Charles about him and when she learned he was a cousin of Charles she told him: "You are very welcome; the more we can get together of the blood of the King of France, the better it will be"
"In all her acts, aside from the facts of war, she was just a simple girl. But in war she was very expert, whether to carry a lance, to assemble an army, to order a battle, or to dispose the artillery. All marveled to see how in military matters she acted with as much sagacity and foresight as if she had been a captain, making war for twenty or thirty years. It was especially in the placing of artillery that she well understood herself." Alencon was the official commander of the army at Orleans and in most of the Loire Valley campaign however he easily cooperated with Joan and together they won great victories like Orleans and Patay. A scene later described by Alencon at the Trial of Rehabilitation that occurred during the fighting at the town of Jargeau typifies their relationship in battle: "The heralds cried, 'To the assault!' And Joan herself said to me, 'Forward, gentle duke, to the assault!' To me, this was premature. Joan answered, 'Have no fear, this is the hour that pleases god, and when God wills it, that is the moment to take action. Help yourself, and heaven will help you!' And she added, 'Gentle duke, are you afraid? Do you not remember that I promised your wife to bring you back safe and sound?'" Alencon was present with Joan at the coronation of Charles VII at Reims and afterwards desired as Joan did to continue fighting the English. He and Joan attempted to liberate Paris in September of 1429 but were thwarted by the actions of Charles VII who ordered that they abandon the fighting after Joan was wounded on the first day. A few weeks later Charles disbanded the army and Alencon returned to his home region of Normandy to continue fighting the English there and ultimately it meant that he and Joan would never again be comrades in arms. After Joan's death in 1431, Alencon continued to fight against the English for at least the next twenty years however his relationship with Charles VII soured considerable. Whether it was the financial troubles that continued to plague him or some other reason Alencon eventually turned against Charles VII and was even condemned to death for treason against the King. His sentence was commuted to imprisonment by Charles VII and he was ultimately pardoned by Louis XI when Charles died. For Alencon the best time of his life seems to have been the short period at the side of Joan of Arc when he was part of accomplishing spectacular feats. After Joan was gone he was apparently never the same man again.